USDA Certified 100% Organic & Certified Kosher, Organic Milkmaid Tea was created for those times when the "milk of momness" needs a little encouragement. Tasty iced or hot Organic Milkmaid Tea is a fragrant and comforting blend of organic herbs traditionally used to help support healthy breast milk production. 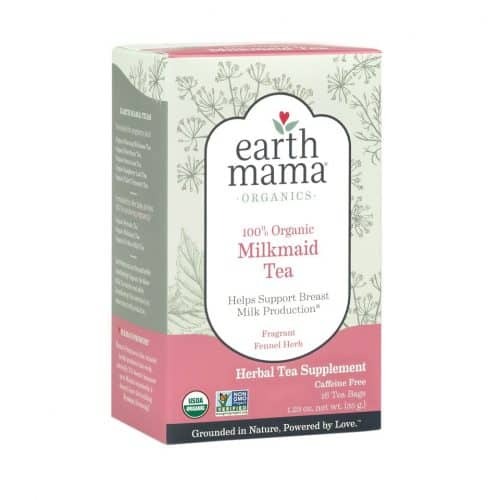 Blended with traditional herbal galactagogues, including Fennel, Fenugreek, Anise seed and Caraway seed, and mineral packed Nettle and Red Raspberry leaf, Organic Milkmaid Tea helps keep breast milk flowing from healthy mama to healthy baby. NOT FOR USE DURING PREGNANCY: These herbs are not recommended for use during pregnancy in greater than culinary amounts. Earth Mama Angel Baby tea bags are biodegradable, the tea overwrap is compostable and the 100% recycled and recyclable cartons were produced using wind energy. Steep, sip and enjoy, mama!